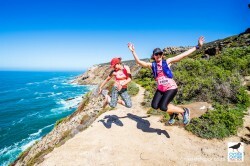 The world-famous Oystercatcher hiking trail again played host to the annual 2 and 3-day Oystercatcher Trail Run. The event aims to not only provide trail runners with an enjoyable and challenging route but to also educate participants about South Africa’s fragile natural environment. The 2018 edition of this event again stretched over two weekends with the 3-day run taking place over the Heritage Day weekend and the 2-day option over the weekend of 29-30 September. The two runs were identical except for the 3-day event’s extra day that covered 16km from the Gourikwa Nature Reserve to the Eco Marine Lodge. At the end of the first day of the 3-day event, Ian Kent was first to cross the finish line with a time of 01:16:31. Steven Aronson came in second sporting a time of 01:22:57 and third position was taken by female veteran runner, Carly Kent (01:26:30). The second day, which was also the most technical of the three days, covered a total distance of 20km, starting at the Gouritz river mouth and concluding at the Sandpiper Cottages and Sports Centre in Boggoms Bay. And although technical and challenging at times with runners having to traverse small, ankle-rolling boulders, this second stage also offered magnificent plant life and sea views that this world-renowned trail is famous for. The 2-day event, which took place the following weekend, was dominated by the ladies with more than 70% of the runners being female. This year saw a very special entrant, the 77-year-old Willemien Smuts, who completed the trail run with her daughter. Trail running truly is a sport for all ages (as Willemien has proven) and the Oystercatcher Trail Run is the perfect event for first timers who want to try their hand (and feet!) at multi-day events. With the emphasis being placed on enjoying the experience while having fun with fellow runners, surrounded by the Garden Route’s beautiful natural scenery, this is a great event for athletes of all fitness levels and ages. Events like these would not be possible without the help of sponsors and the organizers of the Oystercatcher Trail Run would like to thank Fred Orban and the Sandpiper Cottages and Sports Centre, First Ascent, Gourikwa Nature Reserve, Eco Marine Lodge and Glenhoff Craft Beer for their support. The full list of results can be viewed online and pictures of the event are posted on the Oystercatcher Trail Run Facebook page.